The Aare (German pronunciation: [ˈaːrə]) or Aar is a tributary of the High Rhine and the longest river that both rises and ends entirely within Switzerland. Its total length from its source to its junction with the Rhine comprises about 295 km (183 miles), during which distance it descends 1,565 m (5,135 ft), draining an area of 17,779 km2 (6,865 sq mi), almost entirely within Switzerland, and accounting for close to half the area of the country, including all of Central Switzerland. 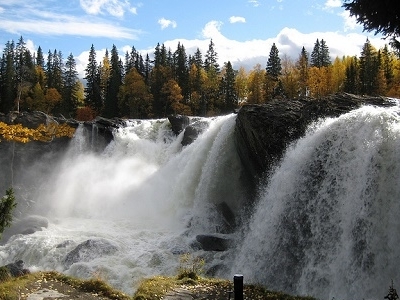 There are more than 40 hydroelectric plants along the course of the Aare River. The river's name dates to at least the La Tène period, and it is attested as Nantaror "Aare valley" in the Berne zinc tablet which dates back to Roman Gaul. Near the west end of Lake Thun, the river receives the waters of the Kander, which has just been joined by the Simme. Lake Thun marks the head of navigation. 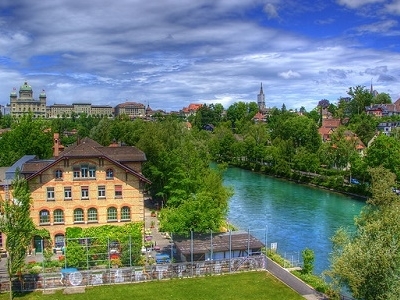 On flowing out of the lake it passes through Thun, and then flows through the city of Bern, passing beneath eighteen bridges and around the steeply-flanked peninsula on which the Old City is located. The river soon changes its northwesterly flow for a due westerly direction, but after receiving the Saane or Sarine it turns north until it nears Aarberg. There, in one of the major Swiss engineering feats of the 19th century, the Jura water correction, the river, which had previously rendered the countryside north of Bern a swampland through frequent flooding, was diverted by the Hagneck Canal into the Lake of Bienne. From the upper end of the lake, at Nidau, the river issues through the Nidau-Büren channel, also called the Aare Canal, and then runs east to Büren. The lake absorbs huge amounts of eroded gravel and snowmelt that the river brings from the Alps, and the former swamps have become fruitful plains: they are known as the "vegetable garden of Switzerland". 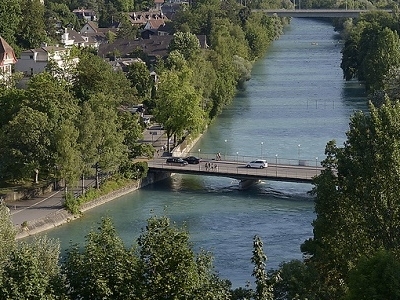 From here the Aare flows northeast for a long distance, past the ambassador town Solothurn (below which the Grosse Emme flows in on the right), Aarburg (where it is joined by the Wigger), Olten, Aarau, near which is the junction with the Suhre, and Wildegg, where the Hallwiler Aa falls in on the right. A short distance further, below Brugg it receives first the Reuss, and shortly afterwards the Limmat. It now turns due north, and soon becomes itself a tributary of the Rhine, which it surpasses in volume when the two rivers unite at Koblenz (Switzerland), opposite Waldshut, Germany. The Rhine, in turn, empties into the North Sea after crossing into the Netherlands. Here's the our members favorite photos of "Rivers in Switzerland". Upload your photo of Aare River!